The first Republican debate was a lively one. Topics spanned the gauntlet of domestic issues with a few foreign policy and defense topics sprinkled in – mainstays of the Republican platform. So what did these 10 hopefuls have to say? A mix of hollow statements, generalities and a host of blatant inaccuracies. It’s not easy getting substance out of any candidate for President when the debate stage is as stuffed as it was on Thursday night in Cleveland. Having just 90 seconds to get your boilerplate platform out there and then actually addressing complex issues is nearly impossible. As such, we’ll take a look what the candidates said and – more importantly – didn’t say when it comes to defense and foreign policy. The fact of the matter is that only a handful of the candidates were actually asked foreign policy questions. One of the most heated exchanges came between Governor Chris Christie and Rand Paul, who are not known to have much love when it comes to how they would treat the NSA’s bulk surveillance programs. Rand Paul demanded that personal freedoms are protected and warrants are garnered by the government when spying on U.S. citizens, while Christie accused Paul of not knowing what it’s like fighting terrorism directly, as he supposedly did as an the U.S. Attorney for the District of New Jersey. The whole blowout ended in a crack about Christie hugging Obama during Hurricane Sandy. It was the most fiery exchange of the night and probably didn’t help either candidates bid for the White House. Not that the rest of the field did much better. One area where there was little difference between the candidates – aside from their level of hyperbole – was their outright disapproval of recent cuts to America’s military force structure, as well as their seemingly unified hatred for the Iranian nuclear deal. Did We Just Give Iran The Bomb Or Did We Usher In A New Era Of Peace? Paul- “I oppose the Iranian deal, and will vote against it. I don’t think that the president negotiated from a position of strength, but I don’t immediately discount negotiations. Nobody actually articulated an alternative to the deal aside from that they would have negotiated much harder with Tehran, increasing sanctions not easing them, or seemingly not negotiated at all. American captives currently in Iranian custody were brought up in relation to the talks, as well as a highlight to just how little we got in return for the deal. In all, the mood vis-a-vis Iran was very dark, although a military operation to destroy Iran’s ability to ever build a nuclear bomb was not discussed. America’s declining military force structure did pop up on several occasions. Carson- “Well, what we have to stop and think about is that we have weakened ourselves militarily to such an extent that if affects all of our military policies. Our Navy is at its smallest size since 1917; our Air Force, since 1940. In recent testimony, the commandant of the Marine Corps said half of the non-deployed units were not ready and you know, the sequester is cutting the heart out of our personnel. Our generals are retiring because they don’t want to be part of this, and at the same time, our enemies are increasing. Our — our friends can’t trust us anymore. You know, Ukraine was a nuclear-armed state. They gave away their nuclear arms with the understanding that we would protect them. We won’t even give them offensive weapons. Carson’s claims about the size of the Navy, Air Force and the readiness of our forces may be true, sequestration had a very deep, albeit temporary impact on readiness especially. This came on top of drastic declines in equipment inventories across the services that started after the Cold War, and then happened again in the later part of the last decade, and then again in recent years. Still, comparing the size of our Navy, or even the Air Force (aka the U.S. Army Air Corps in 1940) is a amateurish way of handicapping America’s naval or air combat capabilities. “then and now” metrics does not adequately reflect its capability. The naval side of this occasion is no different. In 1917 naval warfare was about ship-to-ship within line of sight combat and shelling shore targets. Today, a single Arleigh Burke Class destroyer sports 96 vertical launch tubes capable of carrying a wide variety of anti-air as well as anti-submarine weaponry and Tomahawk Cruise Missiles. It also carries a pair of multi-role MH-60R helicopters, a 5-inch deck gun and other smaller armaments. In other words, using the simple number of ships to compare our naval capabilities then and now is an absurd metric. What is more valid is the force structure, as in the types of ships you have and their capabilities, balanced against their readiness levels and their number in inventory. So yes, while quantity has a quality all of its own, when it comes to modern naval combat, you balance capabilities for production numbers based on a finite budget. Simply put, comparing our air force to the one we had in 1940 and or our Navy to the one we have in 1917 on numbers of airframes or hulls alone in order to rationalize the need to increase those inventories is highly misleading. As far as Carson’s statement that Ukraine gave up their arms as part of an agreement that we would defend them if their borders were threatened, he is referring to the 1994 Budapest Memorandum on Security Assurances. This agreement is much more murky than a clear pledge or treaty stating that we would defend Ukraine’s borders against external attack. Furthermore, since Russia was once a partner in it this agreement, and seeing that the new government in Kiev came to power through revolution, it makes its validity even more questionable. As such, the decision to provide Ukraine’s military with conventional arms, such as advanced anti-tank missiles, is largely a political one, and it is a decision that some see as a sure way to escalate the the already highly volatile situation. Meanwhile, others see arming Ukraine as backing an ally up. Either way, the decision is not driven by a formal treaty or international agreement. Carson- “You know, what we do in order to get the information that we need is our business, and I wouldn’t necessarily be broadcasting what we’re going to do. We’ve gotten into this — this mindset of fighting politically correct wars. There is no such thing as a politically correct war. The left, of course, will say Carson doesn’t believe in the Geneva Convention, Carson doesn’t believe in fighting stupid wars. And — and what we have to remember is we want to utilize the tremendous intellect that we have in the military to win wars. And I’ve talked to a lot of the generals, a lot of our advanced people. And believe me, if we gave them the mission, which is what the commander-in-chief does, they would be able to carry it out. The use of torture, including waterboarding, for interrogations of prisoners at the hands of U.S. counter-terror agents remains a hot topic today, even though it remains unclear if any information was ever gained from these tactics that garnered actionable intelligence. We do know that these techniques have provided our enemies with an incredible recruitment tool and is a central theme whenever American hypocrisy comes up in conversation in relation to the Global War on Terror. As for tying the Generals hands behind their back, this too is a controversial issue. If civilian leadership just gave the military a blank check, nuclear Armageddon would have occurred long ago. At the same time, when you look at Vietnam and even the bombing campaign on ISIS today, it is clear that too much political interference can greatly handicap the military’s ability to realize any true goals on the battlefield. As such, there may not be any reason to risk American lives and treasure in the first place. Walker- “Well first off, for the cyber attack with Russia the other day, it’s sad to think right now, but probably the Russian and Chinese government know more about Hillary Clinton’s e-mail server than do the members of the United States Congress. And — and that has put our national security at risk. If I am president, he won’t think about that. You know, Putin believes in the old Lenin adage: you probe with bayonets. When you find mush, you push. When you find steel, you stop. Beyond the hit against Hillary’s basement email server, and the potentially valid Lenin reference, he makes it clear that he would arm Ukraine with weaponry, although exactly to what extent we don’t know. As far as putting forces on the eastern border of Poland and the Baltic nations, this is already occurring and enhancing the size of such a static deployment would require a long-term investment in expanding our Army’s force structure. When it comes to the missile defense system in Poland and the Czech Republic Scott refers to, it was not so much cancelled but restructured to employ more mature and affordable technology based on the Navy’s cruiser and destroyer deployed AEGIS combat system. As such, it is intended for medium and short range ballistic missiles. Also, remember that this system was never really aimed at Russia but at Iran. Meaning Russia could just launch more ballistic missiles than there were long-range interceptors available if it wanted to. Also, AEGIS Ashore is a more scalable option than its longer-range and more complex cousin, relying on multiple missiles being packed in vertical launch containers instead of underground silos holding a single interceptor each. Keep in mind that the U.S. also has AEGIS ballistic missile defense ships that are forward deployed to Europe with largely redundant capability. Walker- “What about then (ph), we need to focus on the ones we have. You look at Egypt, probably the best relationship we’ve had in Israel, at least in my lifetime, incredibly important. As for our relationship with Israel, it is very clear that it is at its lowest point in decades due to the tense relationship between President Obama and Prime Minister Netanyahu. A condition that has since been greatly exacerbated by the Iranian nuclear deal which the sitting Israeli Government greatly opposes. As for leading from the behind, that is a widely held opinion by many who have seen the Obama Administration as weak, especially since not fulfilling its “red line” promise when it came to the Al Assad regime’s use of chemical weapons in Syria. The Arab Gulf States also widely oppose the Iranian nuclear deal, including Saudi Arabia, although they remain close allies with the U.S.
Huckabee- “The military is not a social experiment. The purpose of the military is kill people and break things. It’s not to transform the culture by trying out some ideas that some people think would make us a different country and more diverse. The purpose is to protect America. I’m not sure how paying for transgender surgery for soldiers, sailors, airmen, marines makes our country safer. We’ve reduced the military by 25 percent under President Obama. The disaster is that we’ve forgotten why we have a military. The purpose of it is to make sure that we protect every American, wherever that American is, and if an American is calling out for help, whether it’s in Benghazi or at the border, then we ought to be able to answer it. As far as his opening statement about how the military is not there to transform the culture by “trying out some ideas people think would make us a different country and more diverse.” This is a pretty narrow and historically troubling point of view. Just read about these guys whose level of service was also seen as a “social experiment” by many. Isn’t a country’s fighting force at its best when as many areas of that country’s cultural and ethnic makeup are represented within that force? It is not about making exceptions, a person’s love interests, or how individuals see themselves within society, it is about getting the best people possible to take the fight to the enemy. Take this top Air Force pilot for instance who was kicked out of the USAF for being gay. This man was a top professional in his field and was highly regarded in his squadron, but because of an archaic Pentagon policy America lost a deadly asset. In the end, Don’t Ask Don’t Tell, and what went on before it, will be looked at as a result of a dark age in America’s history and I doubt transgender discrimination within the services will be regarded any different. Additionally, one’s personal or religious views on homosexuality or transgender people are protected, but the Pentagon is not a religious institution. As such, repealing sexual orientation restrictions is an exercise in the separation between church and state at its most basic level more than anything else. When it comes to the Governor’s statement that the military has been reduced by 25 percent under President Obama, it is unclear exactly what he is referring to. When it comes to baseline defense budgets, minus the supplemental budgets for the wars in Afghanistan and Iraq, the has been little change since the Bush years. Even at the height of the both wars, the decrease in spending compared to today is still well below a consistent change of 25 percent. So with this in mind, Huckabee’s 25 percent number could be just something anecdotal to underline the large cuts in force structure over the last decade, including combat vehicles, but that would make it once again misleading. Then there was the Governors quip about how the how the military has been decimated and used the B-52’s age as an example. As for 44 combat capable B-52s, I am not certain where Huckabee gets this number. I can find this source from 20 years ago stating it under one plan, but the reality is that 76 B-52s are slated for inventory, and yes a portion of those are used for training and are in heavy maintenance at any given time. Under those circumstances, are there 44 B-52s available to fly at all times? Possibly, although the same math can be applied to any aircraft fleet out there, even America’s newest aircraft like the F-22. Of the 186 F-22 Raptors in its inventory, 123 are frontline combat aircraft, 20 are reserve aircraft, and the rest are used for training and development. This does not take into account the aircraft’s availability rate or those down for deep maintenance and upgrade. When you factor in those circumstances, the number probably drops well below 100 airframes available to fly combat missions at any given time with any confidence. As for the B-52s being old, and as such they need immediate replacement, Huckabee was far off mark. The B-52 is an ever more capable and reliable weapons and sensor truck that has a relevant place in the U.S. arsenal. Currently, the airframe is stated to be in service till 2040, although it will likely serve well beyond this mark. The only thing the aircraft lacks when it comes to flight systems and structure are newer, more powerful and fuel efficient engines that would increase the B-52s range and allow it to operate from smaller runways and at lower costs per flight hour. The option of re-engining the B-52H force has been kicked around for many decades, and it, along with many other weapon system upgrades, are being looked at once again as a possibilities to make the B-52 better, not to replace it. If anything, such investments into the 50+ year old bomber are a testament to its longevity and relevance, not the other way around. Finally, a replacement multi-role sensor node and bomber is already in the works under the Long Range Strike Bomber program, which the Obama Administration has decided to fund developmentally so far, with a winning bidder being selected within weeks. This program can be accelerated, and its funding can be made a priority to realize the maximum 120 stealthy bombers asked for by the USAF, but that number, along with the B-2 force, will still be smaller than our bomber inventory today which is made up of the B-1B, B-2 and B-52 fleets. As such, the B-52 will likely soldier on alongside even the latest and greatest bomber for decades to come. Christie- “You know, if we want to deal with these issues, we have to deal with them in a way that makes sense. I agree with what Dr. Carson said earlier. The first thing we need to do to make America stronger is to strengthen our military, and I put out a really specific plan: no less than 500,000 active duty soldiers in the Army. No less than 185,000 active duty marines in the Marine Corps. Bring us to a 350 ship Navy again, and modernize the Ohio class of submarines, and bring our Air Force back to 2,600 aircraft that are ready to go. The numbers Christie states for force levels within the USMC and the Army are very similar to the force levels we have today. Currently, there are 490,000 soldiers in the Army, just 10,000 shy of his 500,000 goal. By 2017, under Obama’s current plans, that number will drop to 450,000 soldiers. This is down from a peak war-time number of 570,000 in 2012. The same can be said for the USMC when it comes to force levels. Today, the USMC has 184,000 Marines, just 1,000 short of Christie’s goal. Under current plans, this number will drop to 174,000 by 2017. This drop is relevant in size, but under Christie’s plan, the USMC is only 6 percent larger than what Obama has in mind. Christie, pulls from Reagan’s playbook by touting a goal for the U.S. Navy based of hull numbers, not capabilities. In this case he says his plans shoot for a 350 ship Navy. Currently, the Navy is working towards fielding 308 ships by 2020, 42 ships short of Christie’s goal. Today there are roughly 288 ships in the U.S. naval combat fleet. Although building up America’s Naval force may be a good idea, the goal of an X number of ships in the Navy is totally antiquated. In an age when you can bolt fairly advanced missile systems to any sea going vessel, or punch out Littoral Combat Ships by the dozen that have questionable combat capability, even the densest plans for reinvigorating the Navy’s hull numbers can be totally hollow. In fact, by not building a proper force mix, for instance building to many ships that are largely defenseless when it comes to aerial attack, without either upgrading their anti-air capabilities or building more guided missile cruisers and destroyers to protect them, can actually leave a force burdened by unneeded fat in a time of peace and vulnerable to disaster during a time of war. A better way to approach such an answer would be for a candidate to state how much of the cruiser, destroyer, carrier, littoral combat, submarine and amphibious force they are looking to increase or decrease instead of making blanket hull number promises. Christie’s comment about modernizing the Ohio Class nuclear ballistic submarine force seems to be inaccurate. The Ohio Class needs replacement, not modernization, as they are approaching the end of the serviceable lives and must be replaced to remain survivable against emerging enemy capabilities and to continue for decades as a reliable second strike nuclear deterrent. An upgrade to the Ohio class SSBN force would be seen by many in defense community as a monumental step back, even from budgetarily tight current plan to replace them. As far as building the air force back into a force of 2,600 aircraft, we can assume he is talking about “shooters,” or combat aircraft that employ ordinance as a major part of their mission set. Today, the USAF has about 2,283 of these aircraft, which include fighters, gunships, bombers and unmanned aircraft capable of attack such as the Predator and Reaper. Without the unmanned systems, this number sits at 2025. Fielding an extra 317 combat aircraft is doable, but it will mean certain legacy systems, such as a portion of the F-16 force, will need structural and avionics upgrades to remain viable. Additionally, Christie’s plan will almost have to include retaining the A-10 Warthog fleet in order to meet its lofty inventory goals. Bush- “Knowing what we know now, with faulty intelligence, and not having security be the first priority when — when we invaded, it was a mistake. I wouldn’t have gone in, however, for the people that did lose their lives, and the families that suffer because of it — I know this full well because as governor of the state of Florida, I called every one of them. Every one of them that I could find to tell them that I was praying for them, that I cared about them, and it was really hard to do. So, why it was difficult for me to do it was based on that. Here’s the lesson that we should take from this, which relates to this whole subject, Barack Obama became president, and he abandoned Iraq. He left, and when he left Al Qaida was done for. ISIS was created because of the void that we left, and that void now exists as a caliphate the size of Indiana. This statement has some disjointed cause and effect clauses in it that are hard to unpack. In the end Bush is right that leaving Iraq created the vacuum that allowed ISIS to expand to the degree it has, but then again we would never have been there at all if his brother’s Administration had not pushed so hard to make the case to invade. A case that was made almost solely on the idea that Saddam Hussein had stockpiles of weapons of mass destruction. This turned out to be largely untrue. Undoubtedly, the Bush name is Jeb’s biggest handicap in getting elected in the long term as Operation Iraqi Freedom, including Obama’s blundering exit strategy, will go down as one of the worst military failures in modern history. Cruz- “We need a commander in chief that speaks the truth. We will not defeat radical Islamic terrorism so long as we have a president unwilling to utter the words, radical Islamic terrorism. When I asked General Dempsey, the chairman of the joint chiefs, what would be required militarily to destroy ISIS, he said there is no military solution. We need to change the conditions on the ground so that young men are not in poverty and susceptible to radicalization. That, with all due respect, is nonsense. Denying that hopelessness, lack of purpose and poverty are not key conditions where everything from gangs to ISIS easily grows is absurd. Obviously, America cannot put anyone at risk of joining a terrorist outfit on welfare or give them a job, but working to change these conditions with local players is certainly a key part of any useful counter-terrorism strategy. At the same time, the frustration with this Administration’s lack of a true plan to at least remove ISIS from Iraq has become maddening for many. A stronger will to get the job done, along with a clear set of achievable military goals and allowing the military to decide how it will achieve those goals without heavy White House interference are absolutely needed in the near term to change the tide of the anti-ISIS fight. In the end, it was amazing just how little the candidates had to say that was substantially different than the others when it came to military topics and foreign policy. Veterans were mentioned on a few occasions, Rubio touting a bill he had something to do with, but no real clear plan was articulated how we could fix the absolutely dismal way we treat our soldiers returning from the battlefield with psychological issues and horrific wounds. There was also a lot of talk about “Christians heads being cut off” and “horrors” occurring at an alarming rate around the globe, yet very little in the way of even anecdotal ideas on how to stop it were fielded. Sadly, the details that were put forward, most of which are outlined above, are fragmented, and many are just inaccurate. There appears to be no real candidate that has a strong handle on military affairs, at least in the top 10 debate last night. 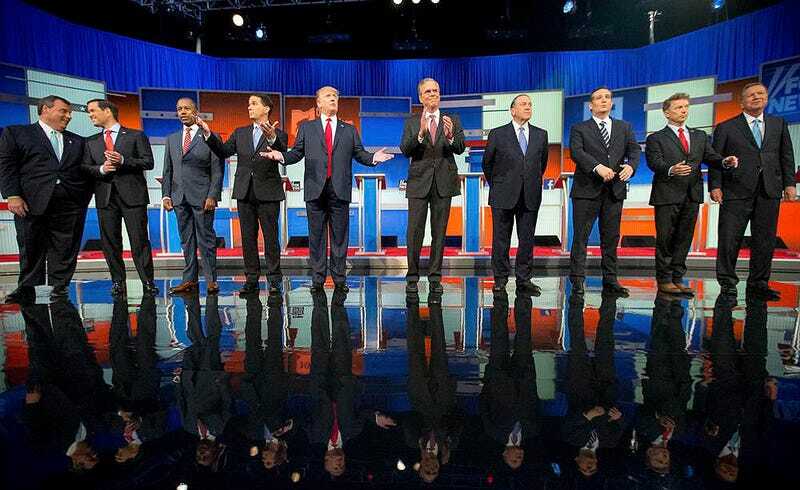 In fact, seeing that ISIS is largely a high priority issue with the American voter, you would think these candidates would all have come up with some idea of how they would approach the situation aside positing that they must be defeated. As always, the discussion on force structure, and America’s aging fleet of ships and aircraft, was only addressed superficially. How these Presidential nominees plan on rebuilding the force while also cutting taxes and doing so many other things remains largely a mystery. As of now, Rand Paul is the only candidate who has put forward a budget, and we will be lucky to ever see any detailed plans out of the rest of them as they fear cuts here and gains there will alienate potential voters. Donald Trump, who has been skewered by the other candidates for his lack of details on claims and proclamations he makes, is really no worse in this matter than any other. Talk is cheap, building a military for the coming decades that can confront so many disparate threats is not. In the end, the only candidate I have heard that can even talk clearly about defense spending and war planning is Lindsay Graham. Hopefully this will change drastically as the campaigns rages on and the field shrinks. As without clarity and proof that the candidate has a handle on the material, we could very well end up with a President who is largely unprepared to face the complex threats that tomorrow is sure to hold.